We need to take action. Now is the time to join #Movember, the world’s biggest movement for men’s health. There are three ways you can take part during the month of November – grow a moustache, take the Move challenge or host an event to raise funds for men’s health. So get your family, friends and workmates involved and let’s stop men dying too young. 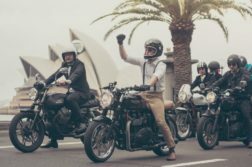 You can also catch the video for the recent Distinguished Gentleman’s Ride, which supports prostate cancer research and male suicide prevention, here. Next Article What’s wrong with this huge $3 billion new airport?